In a leadership change at a high-profile drone startup in the Boston area, CyPhy Works founder Helen Greiner has stepped aside as CEO and moved into the role of chief technology officer. The startup’s new CEO is Lance Vanden Brook, a former executive with warehouse robotics firm Kiva Systems, now owned by Amazon (NASDAQ: AMZN). Fortune reported the news Wednesday night, and CyPhy issued a press release confirming the leadership shakeup Thursday morning. 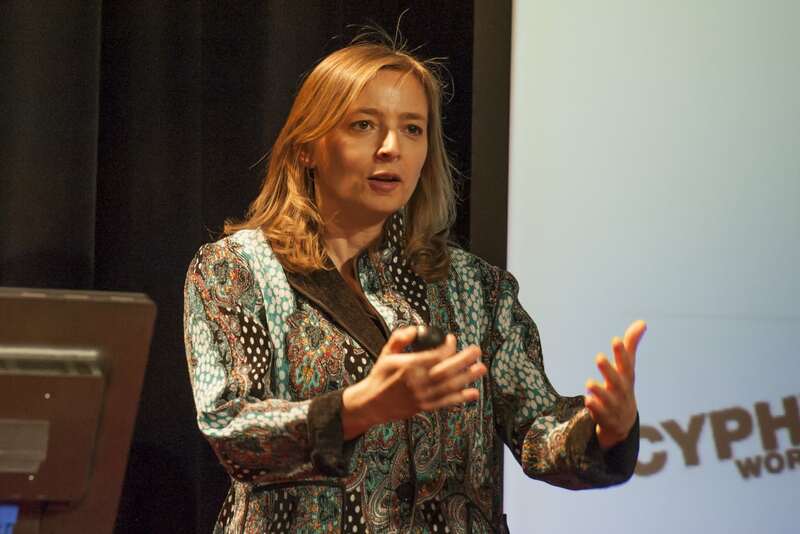 The company also said Amy Villeneuve, former Kiva Systems president and chief operating officer, has become chair of CyPhy’s board. Greiner (pictured above), an MIT-trained engineer and robotics expert, co-founded Bedford, MA-based iRobot (NASDAQ: IRBT) in 1990. The company is best known for making the Roomba robotic vacuum cleaner. During her tenure at iRobot, she held various roles, including vice president of engineering, president, and board chair. She left in 2008 and founded CyPhy in Danvers, MA. The company has developed drones powered via microfilament tethers that CyPhy says keeps data more secure and ensures more reliable data transfer. Its flagship drone can fly 500 feet above the ground. It has also developed a drone small enough to fit in a cargo pocket, which can be controlled by a smartphone or tablet, the company says. CyPhy has raised nearly $35 million from investors including Bessemer Venture Partners, Draper Nexus, Lux Capital, and investment arms of UPS and Motorola. CyPhy’s customers include the U.S. Army, but the company has said its technology has applications in public safety, construction, agriculture, journalism, mining, and other areas. The addition of Vanden Brook seems geared toward accelerating sales of CyPhy’s drones. At Kiva, Vanden Brook was vice president of worldwide sales and solutions. He later led a $1 billion business for Pilot Thomas Logistics, serving as senior vice president of their energy and industrial group.